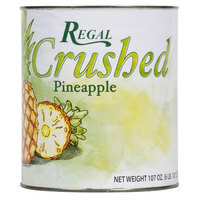 Add something sweet to your menu with the Regal Foods #10 can pineapple tidbits in natural juice. 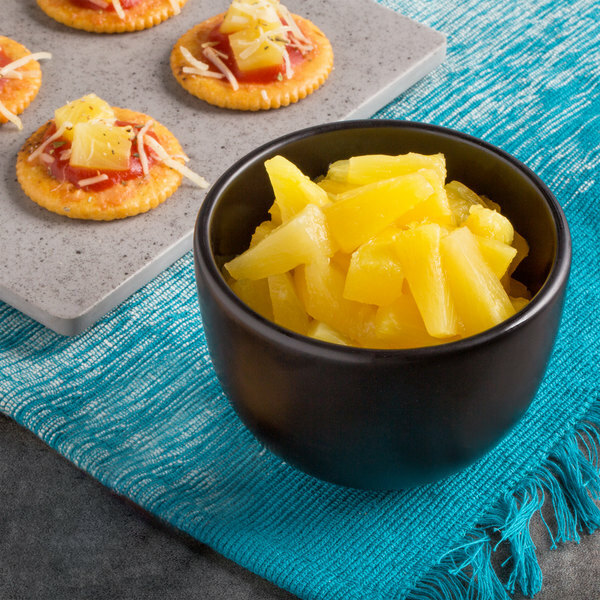 These pineapple tidbits instantly introduce a pop of tropical taste to any meal or fruit based drink! Whether served alone or paired with tender and juicy pork or poultry, these perfectly-sized and wedge-shaped flavorful tidbits make an excellent addition to your diner, cafeteria, or restaurant. "These pineapple tidbits taste great and make an excellent addition to fruit salads, drinks, cakes and frozen yogurt, the juice is natural and sweet, great price!" Try your hand at a classic pineapple upside down cake or experiment with zesty salsas, chutneys, or marinades. Use them as toppings for yogurt or cottage cheese or combine with other fruits like mango, papaya, and banana for a sweet tropical fruit salad. If you operate a pizzeria, these tidbits are the perfect size for a signature Hawaiian pizza! 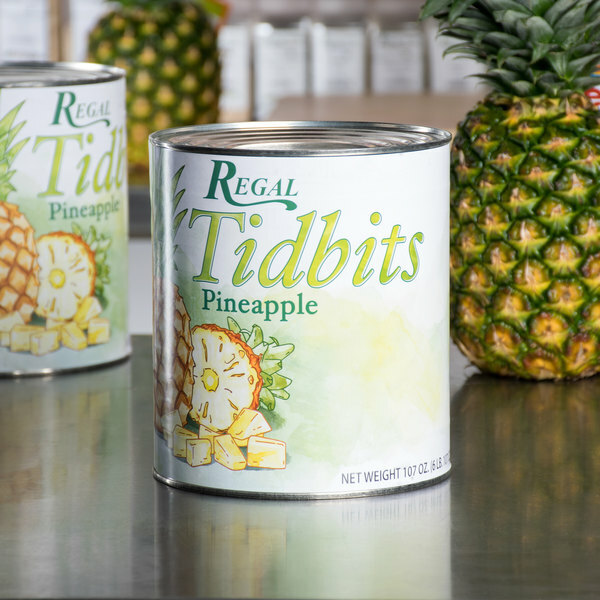 These pineapple tidbits are packaged in their naturally sweetened and slightly tangy juice for easy preparation and superior service. 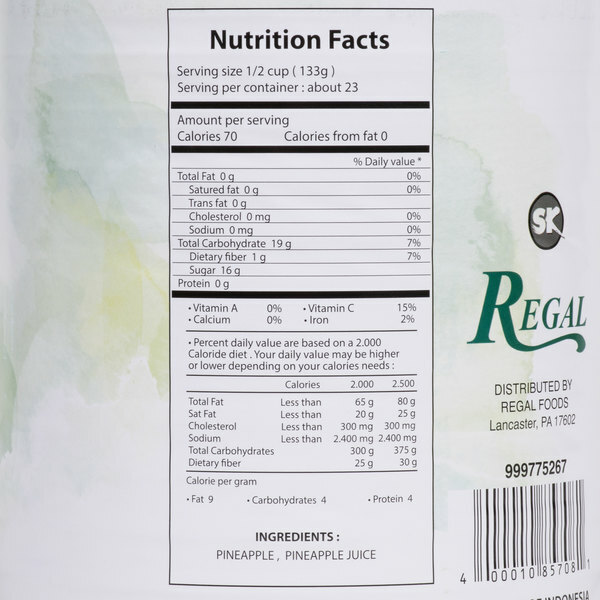 These tidbits come in a #10 can, ensuring that your restaurant will always be in good supply. 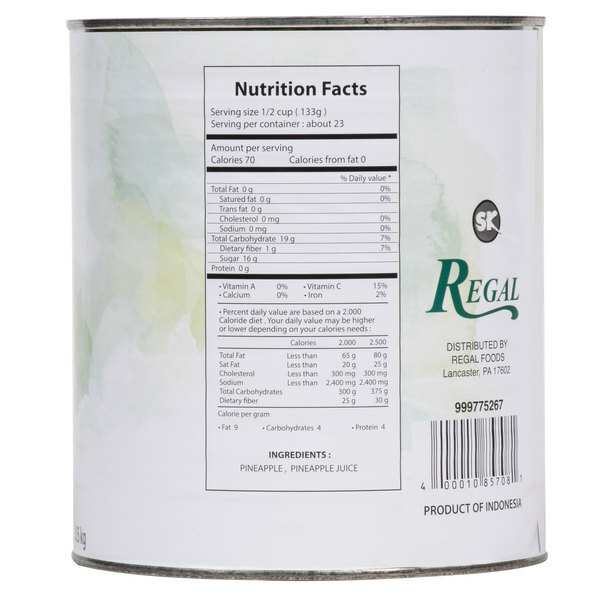 The Regal Foods pineapple tidbits are awesome and have a great texture and make a great addition to our pineapple fudge. So sweet and juicy. We love it. The pineapples tidbits are cut perfect and are a great snack for our little ones at daycare. The pineapple is sweet and well packaged in juice. The pineapple tidbits taste so good and have the natural sweetness. These are great inside of jello..my kids and I love them. Purchasing again for sure. The taste isn't as good as the name brand.Not as sweet.If you're using this on pies then its fine.it went bad before we were able to use the whole can.Wouldn't buy again. 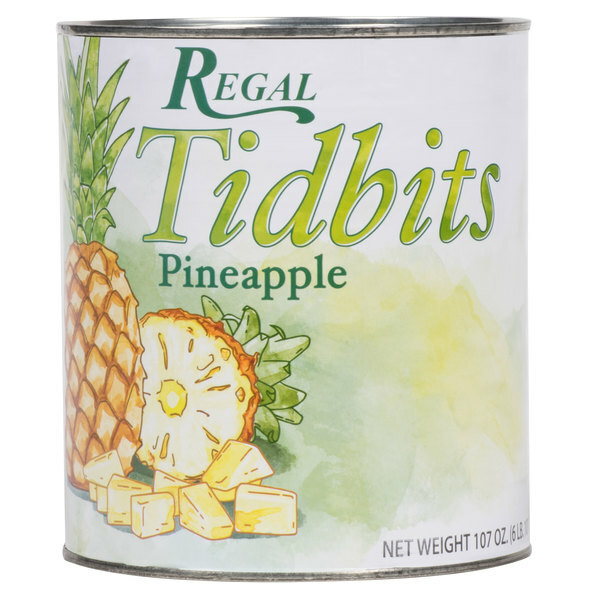 The regal foods pineapple tidbits are great quality. They taste really good and have a nice texture. Great for quick and easy fruit bowls and pies. The pineapple tidbits are great and very tasty. They are perfect for topping pizzas with ham for a great tasting dish. The pineapple is very flavorful. The pineapple tidbits in natural juice are great for adding to our salad bar. The pineapple tastes great and are the perfect size chunks. We love it. This is a wonderful cost effective pineapple for our salad bar and for a pizza topping. Ham & pineapple pizza is delicious with this pineapple tidbits. Would recommend for sure! We appreciate your review, Jennifer! We are sorry these pineapples did not meet your expectations. If you would like a recommendation for a different product, please contact our Customer Solutions team. 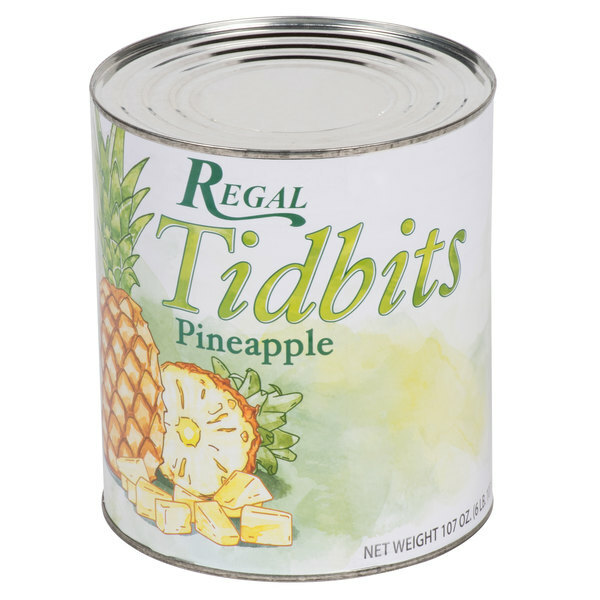 The pineapple tidbits are some of the best canned pineapple I have ever eaten. They are great for adding to fruit salads and fruit cups. tasty pineapple tidbits, at a very good price!! i love pineapple, and i make homemade pineapple preserves using crushed pineapple and pineapple juice. in making these preserves, i always need extra pineapple juice, and i find it easiest to simply buy canned pineapple in pineapple juice and take the extra juice from it. Small enough to use in salads and mix into yogurt or parfaits and large enough to use to top ice cream or pancakes! Great to know it has no aded sugar and is natural- sweet and tangy and good enzymes and vitamins! Sweet pineapple, not sour. Much tastier than other ones I have tried. The juice is so delicious and the chunks are somewhat firm, not mush. These pineapple tidbits are the perfect size. They are definitely not pineapple chunks, which is just what we needed to add to our pizzas, tiny tidbit size. These are good pineapple wedges. They are great as added flavor and appearance to treats. Brown sugar cakes are especially better with these and chunky fruit salsa is too. 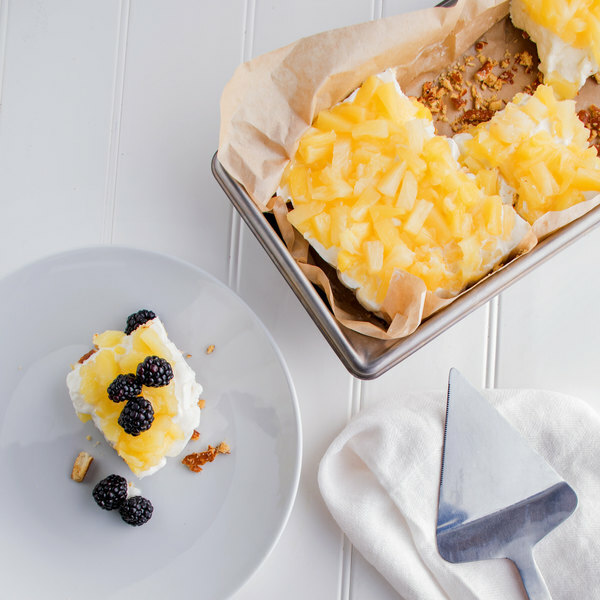 These are fabulous I break down the can into freezer size cantainers and I have Pineapple bits for my famous summer cake low calories and so refreshing. First off, this is an excellent product! We purchased one #10 can for a catering event and fell in love with the freshness and taste! I had thought about buying bulk of the "so called" better brands, but this will be all for us. The quality is second to none! My main reason for purchasing these tidbits were for pizza's. The size was perfect for just that! The taste was great as well. I also, like to save the juice that it's in the can. The juice was delicious just to drink by itself or even add it to a recipe. These pineapple tidbits taste great and make an excellent addition to fruit salads, drinks, cakes and frozen yogurt, the juice is natural and sweet, great price! Pineapple tidbits are great for snack and frozen yogurt topping . It taste great ! The price is cheaper than other. I love to shop on WEbstaurant . 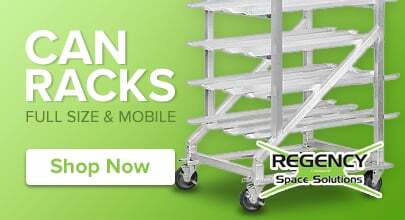 Great product ! Great price ! Thanks. Wonderful time saver! would order again! Thank you so much! I have used it for lunch variety with my daycare kids. Very helpful with the large size cans. The tidbits are not as sweet as the chunks but very yummy. I love them in smoothies. The price is right too because they freeze very well. I bought the diced peaches in light syrup for my mother to use at her day care. She can mix up a mixed fruit cup, or just serve them plain. The kids love them! 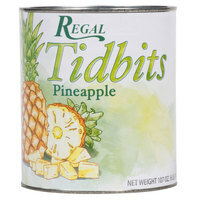 They Pineapple tidbits taste just as good as Del Monte or Dole yet are more than two thirds the cost. We use these in our fruit salad which they are a centerpiece of. I have come to love eating this and mandarin oranges as a late night snack. It is healthier than eating processed sugars often found in super market snacks. Pinapple Tidbits In Natural juices 6=#10 Cans/CS.Is very tasty by itself or on the salad bar with cottage cheese.We aslo make pinapple cake's and pastry's for our bakery side. Customers love the sweey natural taste of pinapple. These were much cheaper than the Del Monte Pineapple Tidbits we were getting, and I think they taste better. They are Just a little sweeter.